Agents from Strutt & Parker have reported that the stunning Grade-I listed Moor Place in Much Hadham, Hertfordshire, is receiving second viewings – though I doubt anyone would spend the offers-over-£17m asking price for the house and 781-acre estate without going back a few more times. The beautiful red-brick house dates from 1779 with later additions, which combine to create an almost perfect view of a Georgian country house. The house was built for James Gordon by the relatively unknown archictect Robert Mitchell who encased the originally Elizabethan house in an elegant facade with the south wing being rebuilt in 1907 by Sir Ernest Newton. Inside a fine cantilevered stone staircase leads up to a master suite and five further bedrooms on the first floor with five more on the floor above. Downstairs the elegant staircase hall leads to a library, dining room and sunny drawing room. More accomodation is available in the 1886 Norman Shaw west wing. All in all, this is a true trophy estate and the proximity to London means that the price tag is, judging by the viewings, not unrealistic. 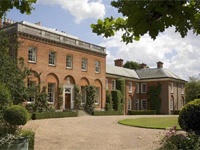 This entry was posted in for sale, News and tagged architecture, country house, estate, for sale, grade-i, hertfordshire, listed, moor place, parkland. Bookmark the permalink. The Elizabethan house was not “encased” by a Georgian facade (in fact the Georgian building is smaller than its Elizabethan predecessor), it was dismantled completely and an entirely new house was built, not even in the same place. On a dry day the foundations of the Elizabethan Manor can be seen on the grass lawns.